The decline of public health is a big problem that also affects the Swedish Armed Forces. New recruits no longer meet the same standard as their predecessors. The Swedish Armed Forces has been training for hundreds of years, and have a found philosophy that you can train everywhere at anytime. Now its time to share the knowledge. How do you launch an old philosophy in a new way? We started FMTK (Swedish Armed Forces Sports Club) and created the FMTK app, a complete and easy accessible training tool for everyone. Wherever you are and whenever you need it. Welcome to the club. Download the app here: App Store, Google Play, Windows Store. Despite the fact that the training industry is booming and that everyone knows the benefits of an active lifestyle, we’re living a life where we don’t move our bodies as much as we once did and a passive lifestyle often leads to ill health and a poorer quality of life. This big problem also affects the Swedish Armed Forces. New recruits no longer meet the same standard as their predecessors and the basic education programs is becoming more insufficient and costly when many recruits drops out due to poor health. Working with the Swedish Armed Forces recruitment, getting the right young people informed and interested in a career is crucial. In order to achieve this relevance and attractiveness is key. Reaching young people at their own platforms on their own terms is fundamental in order to be believable and socially relevant. years, and have a found philosophy that you can train everywhere at anytime. 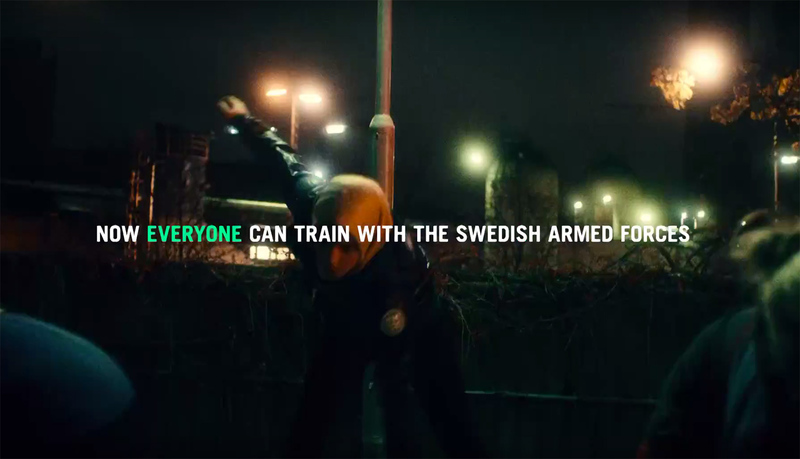 DDB saw an opportunity to make the Swedish Armed Forces relevant to the public in general and the young target audience in particular while preparing recruits for the physical demands faced when joining our organization. Also the Swedish Armed Forces can not stand aside and watch as the public health declines. So we started FMTK (Swedish Armed Forces Sports Club) and launched our old strength-staminamobility-no gear-whatever the situation-whenever the timephilosophy, in a new way. To get people moving, the workout has got to be easily accessible, simple and back to basics and to optimize the reach in our target audience we decided to launch our philosophy in a new way, trough a mobile app. The FMTK-app became the essence of the campaign but also the natural hub for long-term communication. All you needed was your own body and some willpower. And the FMTK app. The foundation when developing the UX was to design a custom workout methodology that actually works on a smartphone. Our main focus was to make a user friendly app, where you could perform a complete workout without being disturbed by technical UI obstacles. By designing a dynamic framework that let the user focus on what is most important for the moment we created a sense of control. The system never uses excessive decoration. Instead, the content must take place and speak for itself. The phone itself is acting adequate framing. 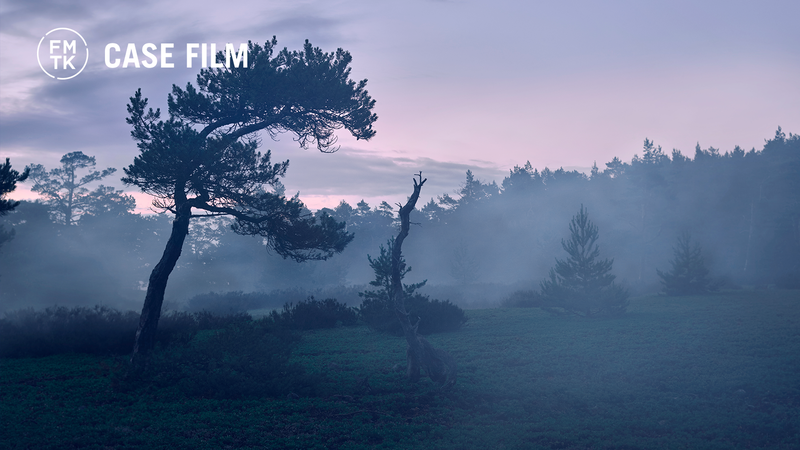 Distance, air and margins are used as design elements in order to separate and structure the content. This led to a smooth and intuitive user flow. When launching the app you immediately can start the workout of the day, no need to navigate complex structures. A filter/sorting function makes it easy to find specific type of workout and there are easy week-by-week training programs to follow and hidden challenges. Track progress and compare results with your friends to maximize your training. The design system should reflect the Armed Forces by giving a trustworthy, yet modern expression. It should feel structured, functional and reliable, but also with a human and inviting touch.. The design experience is a mix of mobile platform patterns and the interactive guidelines developed exclusively for Swedish Armed Forces (which can be found in all of their touch points). That way, we have created a design behavior that the user already is comfortable with but also is unique to the brand. We launched FMTK with a full-on integrated campaign containing a wide range of units and media usage. We also created our own podcast, containing stories and expertise from both the inside and outside of The Swedish Armed Forces. The application hit #1 on App Store on the first day and has ever since hit several other records. The initial goal was 35 000 downloads the first six weeks. After four weeks 180 000 people had downloaded the app, we had 140 000 members and 80 000 started workouts. Six weeks after launch the app have been downloaded 274 000 times, surpassing the initial goal by 783% and FMTK became Sweden’s third largest training community. FMTK has been #1 in both App Store and Google Play and been awarded ”Best New App” and ”Editor’s Choice” in App Store. The podcast has been listened to over 200 000 times. The Launch Campaign itself scored all time high in Ad Liking, Observations and Advertising Attributes. Communicating our knowledge and experience to a wide external audience increases the internal pride within the organization.